← Paralympics, Sochi 2014, ACSM and more! …et La Centieme: The 100th edition of Le Tour, the Tour de France, begins today, with the Grand Start in Corsica for the first time in the race’s history. Who needs the Tricolor? 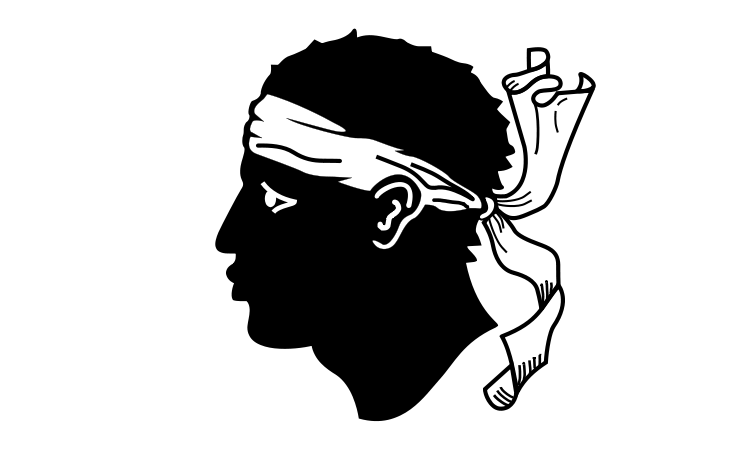 The Flag of Corsica: once an independent republic, now part of France, still with its own language and distinct customs. What a way to celebrate the centennial of the Tour! Corsica, or La Corse, is a French island in the Mediterranean, and is comprised of two of that nation’s departments: Haute-Corse and Corse-du-Sud. It is the only region of France which has not previously hosted a stage of Le Tour. The island has a long history, perhaps best told in one of the finer travel books I have ever read, The Granite Island, by Dorothy Carrington. The island has passed through many hands over its history: the Carthaginians, Romans, Genoans and others have all claimed the island for their own. The island even enjoyed an independent existence for some years: the Corsican Republic was formed in 1755 under the leadership of Pasquale Paoli. 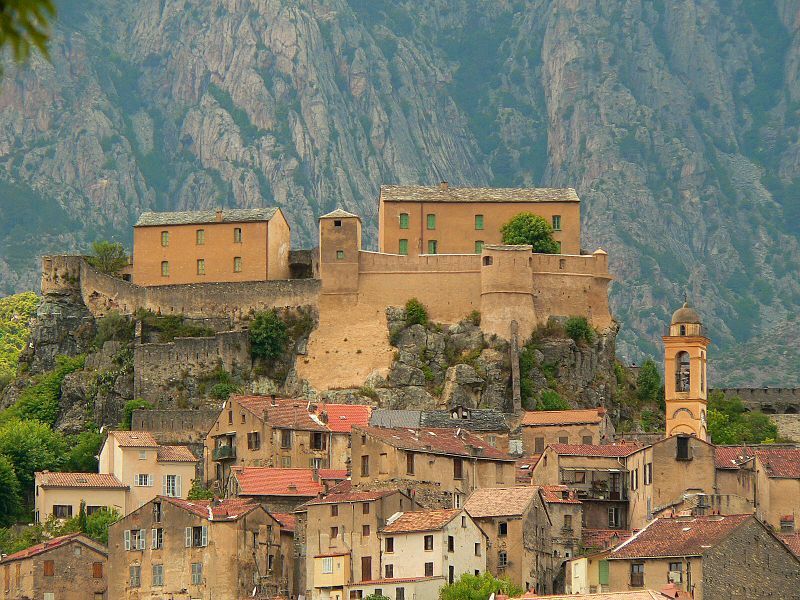 Corsica’s most famous son, Napoleon, was born there in 1769. And it was during the time of the “Napoleonic wars” that he set loose on Europe that the island became part of France. It has remained a part of that country ever since. Corsica is quite simply arresting: from its mountains and trails, to its beaches, to the very smell of the island (its vegetation, known as the ‘maquis’, has a distinctively lovely fragrance), it can put anyone under its spell. That said, I suspect the cyclists in Le Tour this year may be smitten in a different way than I was on my visits. Like any beauty, Corsica has its caprices. The mountains I found lovely will almost certainly pose extraordinary challenges to the competitors. The second stage of the Tour this year will traverse the mountains that form a spine through the center of the Island, heading from Bastia on the east coast, through the mountainous capital of Corte, and ending on the west coast in Ajaccio, the birthplace of Napoleon. The Tour’s website describes the ride as a rollercoaster; “Expect some real damage,” the site boasts menacingly! Let’s hope no one meets his ‘Waterloo’! The Tour is one of my favorite sporting events of the year. The ‘sound’ of my summer over the last several years has been comprised of the dulcet tones of Phil Liggett’s voice. Liggett, an Englishman who lives in South Africa, has been involved with cycling since the 70’s, and for the last several years has been a Tour broadcaster along with former Tour de France cyclists Paul Sherwen (UK) and Bob Roll (US). He is one of the best broacasters of sport I have heard; I would put Liggett in my personal “Broadcasting Hall of Fame,” along with Pat Summerall, Keith Jackson, and Vin Scully. And so, the start of the month-long Tour has my thoughts trending toward the sport of bicycling, and I expect to post on the clinical sports medicine aspects of cycling on at least a few occasions in July. The CJSM has an extensive history looking into the medical aspects of cycling and has published several high quality studies on various medical aspects of the sport. In addition, the CJSM Executive Editor, Chris Hughes, has blogged about the tour in these web pages before. His 2011 post explored the issue of mandatory helmet use legislation in the UK, and led to a robust discussion about the pros and cons of such an intervention in the comments section of the post. I can tell you as the current caretaker of this blog, it is these sorts of respectful, insightful, evidence-based, ‘virtual’ discussions that are highly prized by the editorial staff of CJSM. Take a look at that post, and continue the conversation. As a heads up, so to speak, I can tell you that I’ll be posting a poll on the matter of mandatory bicycle helmet use, and the CJSM has plans for an editorial on the issue in one of its upcoming issues. In lieu of epo, I wonder if anyone in the Tour this year may consider acupuncture for its potential ergogenic effect? Yes, acupuncture. There is an intriguing study from the 2008 CJSM looking at “The Acute Effect of Acpuncture on 20-km Cycling Performance.” Ultimately, I think it was underpowered to show any significant benefit. I think it is, however, an intriguing attempt to look at the potential of acupuncture, which in the eyes of Western Medicine is too often exclusively thought of as a therapeutic intervention for pain, most especially chronic pain; whereas in Traditional Chinese Medicine (TCM), acupuncture has a host of other indications. In the 2008 study by Satpal Dhillon of the University of Alberta, 20 male cyclists were enrolled in a prospective, single-blind cross-over study looking at the potential effect of acupuncture on cycling performance. 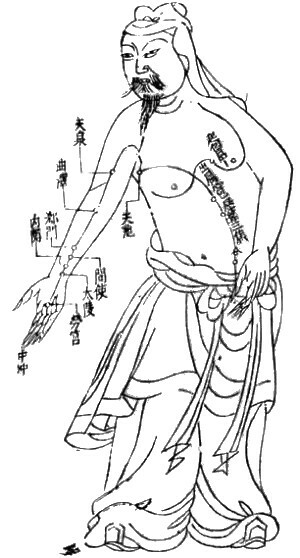 The interventions included acupuncture along traditional meridians (including points such as ST36, GB34, and LV3 for you TCM folks), sham acupuncture (acupoints not on traditional meridians), and no acupuncture. Each of the 20 study subjects did a timed cycle one week apart “…consisting of riding a road bike mounted on a stationary trainer as fast as they could for a simulated 20km.” The riders were sequentially administered the three interventions over the successive weeks’ rides. The four outcomes measured–the dependent variables of the study–included a Borg-scale “Range of Perceived Exertion (RPE),” the time to complete the 20-km simulated ride, a visual analog scale (VAS) for pain, and the blood lactate concentration. Though not a statistically significant result, on average the mean time to complete the 20km ride was lowest in the acupuncture group. The author interprets this and the other non-significant results–including the similar levels of blood lactate in all three intervention arms– in the context of the RPE change to indicate that acpuncture has “…the possible ability to promote increased effort in clients during intense exercise without an increased likelihood of detrimental performance.” In other words, the author argues that acupuncture can increase the threshold of exertion without exceeding the lactate threshold, resulting in improved times. I hope this is a study that will lead to further such investigations, with more study subjects. Perhaps if the study had more subjects it might be powered to elicit, in fact, a statistically significant change in cycling time. If powered sufficiently, one might accept with more confidence that, indeed, blood lactate concentrations were not statistically significant among the different groups. However, as it stands, I think the study makes conclusions that I am not prepared to agree with. I think the author has selectively emphasized some statistically non-significant results to make his conclusions. I would allow, however, that there is merit to looking into these findings with on-going, larger studies. What do you think? Are you familiar with other studies in the sports medicine literature on the potential ergogenic effects of acupuncture? How about studies looking at other clinical, sports medicine applications of that modality? Are you as excited about Le Tour 2013 as I am? Give us a shout in the comments section below or, as ever, on Twitter @cjsmonline. And keep your eyes on this blog in the month of July for more posts on cycling, and a poll on the merits (or not) of mandatory bicycle helmet legislation. Great link Chris thanks for that. Sports medicine: a career for all genders?